Win Some Money This Summer! — Winners posted! 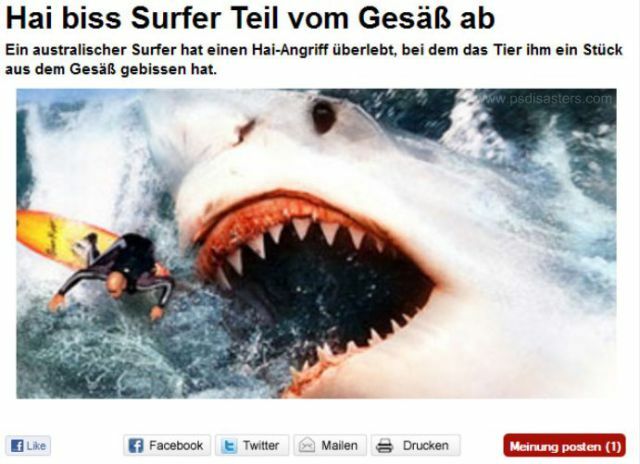 Cons: …and with that, Shark Week stumbles across the finish line. 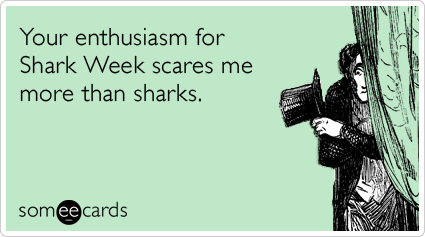 As might be expected, Shark Week 2014 started off with a bang, then started to run out of steam around midweek. Though I was even willing to buy the “speculative documentary” Shark of Darkness for what it was (i.e. a phony documentary designed to create social media buzz), Shark Week 2014’s most questionable move in my book was its inclusion of Megalodon: The New Evidence on Friday, August 15. This program acted as a sort of follow-up to 2013’s Megalodon: The Monster Shark Lives, another pseudo-documentary in which a team of actors …er scientists in South Africa attempts to prove that the gigantic prehistoric shark that has seemingly inspired dozens upon dozens of Syfy Channel made-for-cable movies still roams the earth’s oceans. Unfortunately, in focusing even more attention on an iffy original “documentary” that not only was instantly called out by any and all respectable scientists but also drew heavy criticism from viewers not all that enamored with the fact that Discovery Channel would pass something so blatantly phony off as being real, it appears that Shark Week as a whole is more a publicity-generating machine rather than a unique opportunity to educate viewers about the ocean’s ultimate and most fearsome predators. 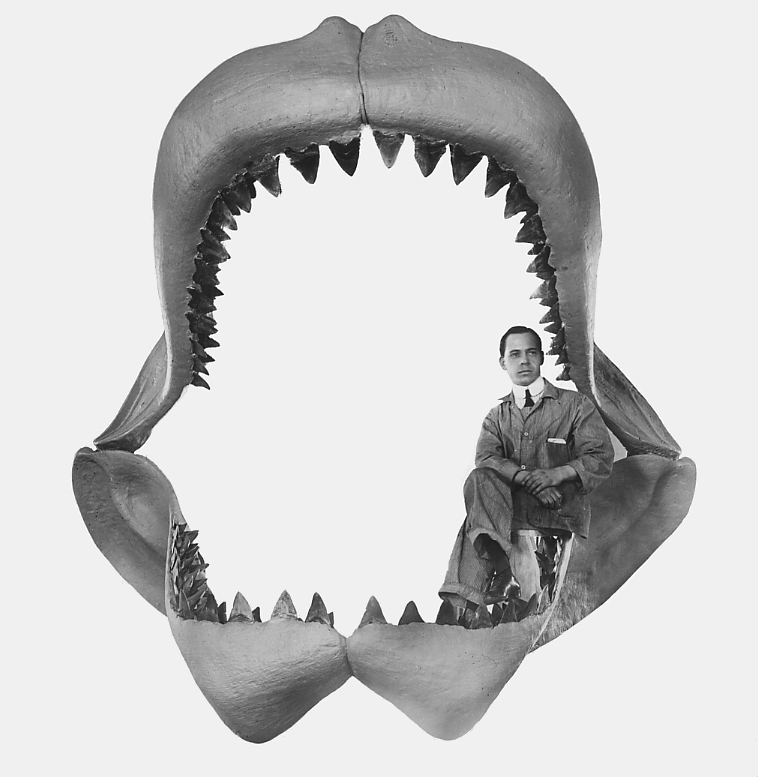 This just in: the boat attack at the center of the Megalodon documentary still didn’t actually happen. Megalodon: The New Evidence took the same format as the equally ridiculous that turned up on Animal Planet a few years back. Set up as a roundtable discussion between Collin Drake, the “scientist” who ran the Megalodon expedition, and interviewer Emmett Miller, The New Evidence went on to provide more sketchy video footage purporting to document the existence of sixty-foot sharks prowling the high seas. 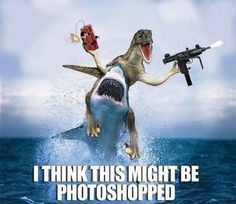 As much as anything seen in the original documentary was not at all convincing, watching “new evidence” showing a huge but obviously computer-generated shark attacking a pod of sperm whales is absolutely preposterous, as is listening to various “expert testimony” about the creature – most of which revolves around (you guessed it) a government conspiracy to hide the truth from the public. Groan! If the information (term used loosely) featured in the show wasn’t bad enough, the news program format seemed very corny and forced – with the actors doing their best but failing to add much credibility to the discussion. Recreated Megalodon jaws. With a little photoshop, this could be more “evidence” proclaiming the creature still exists. I think anyone who would have watched The New Evidence (or the “extended cut” version of the original Monster Shark Lives documentary that preceded it) would know by this point that the whole thing was made up. Hell, if he was paying attention, a viewer would have seen the (purposely) very fleeting admission that “certain events and characters presented in the program have been dramatized.” Still, the whole of The New Evidence program not only seemed like it was beating a horse that died a painful death last year, embroiling the Discovery Channel in all sorts of controversy, but also served absolutely no purpose: to devote a whole night of Shark Week 2014 to the Megalodon considering this already was done the previous year is just absurd. A program like this speaks volumes about the level of incredulity that’s a prerequisite going into any program featured on the Discovery Channel these days. Thankfully, Saturday night’s Great White Matrix got back to basics, focusing on the efforts of longtime Shark Week contributor Andy Casagrande and Australian navy diver and shark attack survivor Paul de Gelder (who lost both his leg and arm to a bull shark attack) to photograph the bite of adult great white sharks using a “Matrix-style” camera rig. This curved assembly of some twenty cameras would allow researchers to study how the physics of a shark bite works from a variety of angles simultaneously, and also enable them to determine the difference between mature shark attacks and those that would be perpetrated by juvenile animals. This footage would be important since Great White Matrix devotes a decent amount of its hour-long duration to examining the possibility that juveniles are responsible for the majority (and an increasing number) of attacks on humans due to the fact that they are sort of “testing the waters” of potential prey items as they transition from feeding on fish (as they do in their adolescent period) to devouring large sea creatures like seals and sea lions once they reach full adulthood. During this program, Casagrande and de Gelder consult various scientists studying the mechanics of the shark jaw, revealing how adult sharks are able not only to inflict heavy damage on their prey but also utilize a sort of vacuum action to capture them. I found this information to be pretty interesting as it explains the very distinctive jaw action in the typical white shark attack – namely, the jaw seeming to protrude from and almost separate from the structure of the head. Juvenile sharks are unable to fully accomplish this action, thus although they are able to inflict severe damage on humans, attacks from juvenile sharks are somewhat more “survivable” than those committed by mature adults. Yikes! Casagrande photographing white sharks sans protective cage. Typical with honest Shark Week documentaries, Great White Matrix had some amazing underwater footage, including truly otherworldly images taken in the Neptune Islands region showing less aggressive sand tiger sharks swimming amidst large schools of bait fish. There’s almost a dream-like quality to some of these images, but the program “gets real” during the climactic scenes in which Cassagrande attempts to photograph the bite of a large white shark nicknamed “Sidewinder.” In the “probably not the safest thing in the world” department, we also get a few jaw-dropping moments in which Cassagrande and de Gelder (who dives with the use of a special prosthetic fin attached in place of his missing leg) swim in shark-infested waters without the use of a protective cage. Though divers can get better camera images without the cage, it seems very dangerous to swim unprotected even around relatively small (i.e. twelve foot) juvenile white sharks. 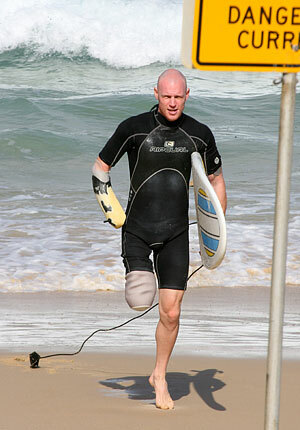 There’s insane, then there’s Paul de Gelder insane – the man still dives even after all losing his arm and leg to a shark. The final original and feature program of 2014’s Shark Week was Sharksanity which aired on Saturday night: just judging by that title (which makes it sound like the next shark-related monster flick playing on Syfy Channel), one can get a pretty good gauge of what a viewer is in for here. Easily the least worthwhile program I saw during this year’s Shark Week, this program was hosted and narrated by “Bob, The Shark,” i.e. the would-be comedian dressed up in a shark costume. Acting as a sort of recap of the entire week’s worth of programming as well as a chance for viewers to vote on their favorite Shark Week moments from this year and past, this show was both completely unnecessary and obnoxious – viewers who had watched the week’s programs would have no reason to watch this “greatest hits” sort of program, and its sole purpose seemed to be to attract large amounts of social media buzz. 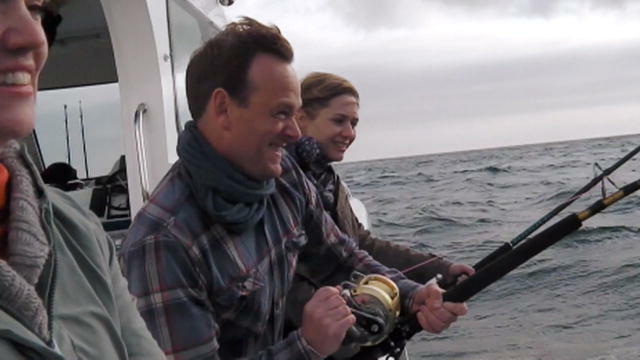 With lousy attempts at humor put forth by the narration, Sharksanity simply replayed various segments from shows that aired earlier in the week while offering up some fan-voted clips that showed the best moments from the 27-year history of Shark Week. These clips fell into various categories – best bite, best “cage rattle,” most fearless filmmaker, best “close call” moment, etc. – and there were some unbelievable moments chronicled. In my mind though, Sharksanity played like one big pat on the back for Discovery Channel – which may be deserved considering the fact that Shark Week has been around for three decades. It also however indicated to me that the motivations for this week-long block of shark-related programming has gotten increasingly questionable over time. In an era where sharks are being hunted almost to the point of extinction in some areas, shouldn’t Shark Week maybe focus more on real issues instead of embracing the fact that some people will prattle away incessantly on twitter and facebook throughout the whole week in an attempt to see their name on TV? Maybe my biggest problem with Shark Week anymore is one that filmmaker Andy Casagrande mentioned himself during the week when he seemed to question whether making specials that focus on gnashing jaws and stories of shark attack victims narrowly escaping death is really having the desired effect on viewers. Jaws author Peter Benchley made it his life’s goal to increase shark conservation efforts despite being the one person perhaps most responsible for defining the shark as the ultimate predator and source of fear for many people. I guess my hope in the end is that Shark Week would turn out to be more than just a high-profile week of sensationalized programming designed simply to create a social media firestorm. Judging from the past few years in which the Discovery Channel has tossed education aside in favor of entertainment though, it seems as if such a proposition is unlikely, and we can probably expect more hit-or-miss programming in the future. One of the channel’s most anticipated annual programming blocks, Discovery Channel’s Shark Week now appears to have adopted the “mockumentary” as one of its hallmark events. The 2014 edition of this week of shows dealing with the ultimate undersea predators kicked off on August 10 with three hours of all-new specials, culminating in the two hour Shark of Darkness: Wrath of Submarine. Having seen quite a few of the fake documentaries that have featured both on Discovery Channel and Animal Planet in recent years, I’d probably call Shark of Darkness one of the more phony-looking ones of the bunch – it’s full of improbable situations, lousy acting, unconvincing action sequences, and lots of iffy historical perspective. It appears that Discovery is no longer even attempting to convince people these shows are authentic, which is perhaps unsurprising after the furor surrounding last year’s Megalodon “documentary.” Though many viewers would quickly dismiss Shark of Darkness as “b.s.” or drone on and on about how they’re “disappointed” that Discovery Channel would air something like this, these people probably should just chill out. It’s well-produced and certainly decent enough for what it is. If you really think this looks like a real newspaper heading, you need to get out more. Prior to the hokey but enjoyable Shark of Darkness, Discovery did choose to air an hour-long legitimate documentary called Air Jaws: Fin of Fury. 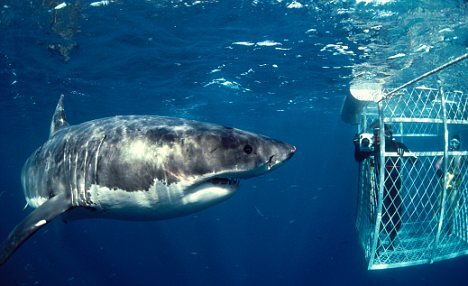 This program followed a camera crew around both South Africa and New Zealand in search of an approximately 18-foot-long great white nicknamed “Colossus.” This animal had been photographed several years ago performing attacks on a rubber seal decoy in which the shark launched itself out of the water in spectacular fashion, then had all but vanished from view. Circa 2013, photographer Jeff Kurr embarks on a journey to try and find the creature again. Images taken of great whites performing aerial attacks in False Bay, South Africa are positively stunning. Fin of Fury features quite a bit of discussion about white shark habits and habitation, exploring the notion that perhaps South Africa’s large colony of great whites migrates to New Zealand at certain times of the year. Per usual, this program features some stunning underwater images of sharks in action: it would be a treat for anyone interested in sharks, particularly the imposing great white. It’s pretty unbelievable to see the sheer number of sharks inhabiting the locations in which this show was filmed: at any given point, there are many (large!) whites surrounding the researchers. Additionally, this program featured a few new innovations for photographing large sharks in their natural habitat. One was a movable cage called the WASP (Water Armor Shark Protection) that allows a cameraman to crawl along the sea floor in a protective suit of steel. This device certainly demonstrated its integrity during Fin of Fury – several sharks appeared quite interested in the contraption and a few even attempted to attack it. By far the more eye-opening sequence in Fin of Fury however was one in which a shark researcher named Dickie Chivell employs a female shark decoy in an attempt to lure large white sharks in. This decoy is one of the flimsiest things imaginable, made of interlocking wooden slats, and it appears to do its job remarkably well since numerous sharks come in to investigate and snap at the thing. Probably one of the most insane stunts ever seen during Shark Week occurs when Dickie decides to ride on and pilot the decoy while several large and inquisitive sharks swirl around. Considering how sketchy an idea this seems indicates that Chivell is either more courageous or more downright stupid (perhaps a combination of both) than most of his colleagues in the field of shark research, but this sequence (along with the genuinely educational value of the program) certainly made Fin of Fury something to see. Chivell’s got some pretty serious balls to be attempting something like this – that shark decoy is FLIMSY! Shark of Darkness, on the other hand, would likely either entertain or annoy any individual viewer. It’s worth pointing out that right off the bat this program declares that “events have been dramatized,” and it seems no accident that that statement is rather ambiguous. I’d go so far as to declare that this entire program is made up, but that’s more or less a moot point with regard to a program that quite obviously is entertainment and nothing else. This program deals with the search for a 35-foot long great white nicknamed “The Submarine” which has been spotted intermittently in South African waters since the early 1970s – speculation about the existence of this creature was part of the inspiration for 2013’s Megalodon: The Monster Shark Lives. This time around, Discovery Channel concocts a story about a whale watching ship that sinks in shark-infested waters, with the presence of the huge “Submarine” hampering the rescue effort. Combining interviews with survivors of the accident, “scientists” and shark eyewitnesses with “authentic footage” and an assured narration, Shark of Darkness is, like most of the other Discovery Channel fake documentaries, fairly clever in its set-up and construction. The fact that this program isn’t as factual as it claims to be however will likely make or break the show for viewers: those looking strictly for educational value will scoff at this thing, but those who just accept it as the entertainment piece is so clearly is will be entertained. As with previous pseudocumentaries, there are several elements that give this one away as being fictional. For one, the “found footage” format used in the program simply doesn’t work after a while: it’s impossible to believe that this many cameras (which just so happen to capture all the major events in the story) were available during the rescue effort which supposedly happened rather hastily and spontaneously. Additionally, though the CGI effects seen throughout this program are capably done (images of a huge shark are added into several scenes, and we even see the beast taking a few human victims), they’re simply not all that convincing – if this footage did exist, don’t you think news agencies would have been all over it? Finally, the script during this program gets all the more ridiculous and incredible as it goes along. I was willing to suspend my disbelief for a certain period of time (and even accept the overly convenient video coverage), but when the “Submarine” takes on almost supernatural powers and scientists endlessly harp on about how intelligent the creature is, the credibility of the program quickly vanished. Although the acting during Shark of Darkness frequently comes across as forced and exaggerated (the whole thing seems very scripted, and one woman’s tearful recollection of the boating accident almost borders on being humorous), the program does effectively crank up the suspense at various times. The “Submarine” is effectively hidden from view much of the time, giving the creature a sort of shadowy, intimidating presence that looms over everything else happening in the film. The imperfect “amateur video” images seen in the film also do their part to make the ongoing story quite tense – especially when one rescuer has to venture into the shark-infested waters in an effort to save three people still (inexplicably) trapped on the sunken vessel. Though this whole notion of people surviving on a submerged ship for quite a lengthy period of time seems completely unlikely (a pretty serious flaw in the script in my opinion), it certainly makes for a potentially frightening conclusion to the story. Generally speaking, Shark of Darkness does a fine job of faking the documentary format, once again demonstrating that Pilgrim Studios (a sort of Discovery Channel R&D department who have produced most of these pseudodocumentaries) have mastered the format. By 2014, it’s been well-established that these sorts of programs are staples of both Animal Planet and Discovery Channel’s programming lineup, making the instantaneous chatter about how this program “isn’t real” more or less irrelevant – after all, is this program any less fake than the swarms of reality TV shows that pop up on Discovery Channel? If anything, I’d have to say that Shark of Darkness, like the other fake documentaries that came before it, deserves commendation for getting people’s attention – shows like this are designed to promote discussion and garner interest, thus I’d have to call the program a massive success. Is “Submarine” really out there somewhere? I’d be the first to declare things like this to be sketchy in terms of their motivations: I’d much rather see legit documentaries on Discovery Channel, but let’s get real: in an era where hype conquers all, it’s not at all surprising that shows like this have taken over even on the “educational channels.” The stream of live Twitter responses featured during the program shows where Discovery Channel’s priorities lie: they try to make these programs into an “event” rather than just another television show. Would a straight-faced documentary have gotten that kind of attention? Surely Shark of Darkness has its problems, but it’s perfect for what it is: viewers willing to roll with the punches are likely to enjoy it. Jacking away your time and money… A different form of meditation. Henry Thoreau on WANT TO IMPROVE YOUR “CHOLESTEROL” NUMBERS? CONSIDER EATING MORE EGG YOLKS! ladyconsumer/Mona on WANT TO IMPROVE YOUR “CHOLESTEROL” NUMBERS? CONSIDER EATING MORE EGG YOLKS! RAM All-Purpose Cleaner: Ewe'll Be Amazed!